In late August 2014, after suffering a defeat in the Supreme Court Hobby Lobby decision when the Court held that business corporations are “persons” that can “exercise religion,” the Department of Health and Human Services (“HHS”) proposed new rules defining “eligible organizations.” Purportedly designed to accommodate the Hobby Lobby ruling, the proposed rules do not comport with the reasoning of that important decision and they unjustifiably seek to permit only a small group of business corporations to be exempt from providing contraceptive coverage on religious grounds. This comment letter to the HHS about its proposed rules makes several theoretical and practical points about the Hobby Lobby holding and how the proposed rules fail to reflect the Court’s reasoning. The letter also addresses other approaches to avoid in the rulemaking process and argues for rules that, unlike what the HHS has proposed, align with the Supreme Court’s reasoning while being consonant with generally applicable precepts of state law and principles of federalism. Letter from Lyman P.Q. 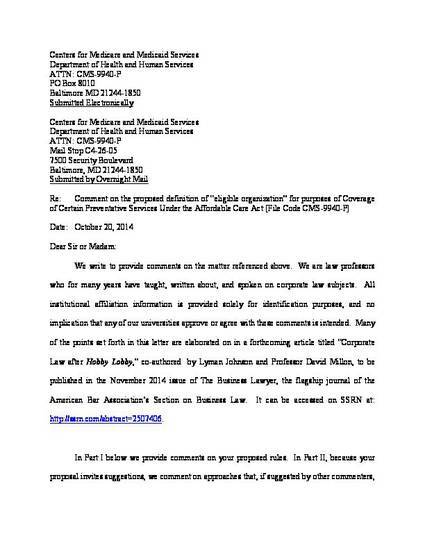 Johnson, et al., to Centers for Medicare and Medicaid Services Department of Health and Human Services (Oct. 20, 2014).